This winter has been pretty dry, a stark contrast to all the rains we received last season that provided bountiful rainy evening night shots. Of course, just because the rain is there doesn't always mean the shot will be perfect. Sometimes, the rain works against you and gets onto the lens. But you want to keep the shot anyway, because it's a different perspective. 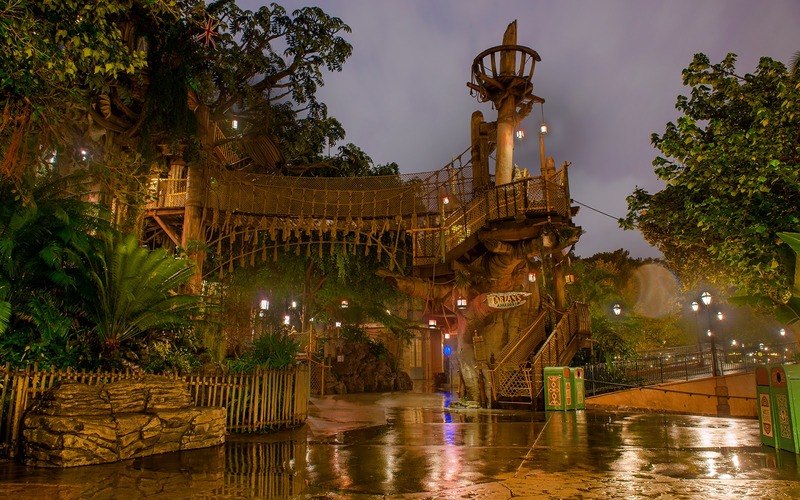 That's pretty much the story behind the photo below, which shows Tarzan's Treehouse--a place I normally feature photos taken from rather than of. But this was a unique night, so the soggy grounds provided a unique picture of a moody, rainy evening. I wish we could have more of those, now! Tarzan's Treehouse on a rainy evening.